A 40-year-old patient developed a meat allergy after a tick bite. This condition has been reported in association of lone star tick bites. She previously lived in a rural part of South Eastern Virginia and actively engaged in gardening and she had two dogs. Over a period of years, she had numerous tick bites. On one occasion she developed a bull’s eye rash after a tick bite and was treated for Lyme disease. It was after this she noticed a reaction to dairy products, causing hives. She had acquired the tick-bite meat allergy syndrome. She was a long time vegan. One would have thought “meat allergy” wouldn’t be a problem. It was. Dairy was surprisingly an issue. She found that she was sensitive to trace amounts of meat. For example, she reacted to vegan food prepared in restaurants that also served meat. She became sensitive to leather shoes and leather belts. She began to have hives daily. Nothing could control the reactions. She became progressively sensitive to a wide array of inciting agents. Chemicals, other foods, environmental changes (change in temperature), non-specific scents would cause reactions. Hives were a daily affair, recurring several times. The hives were severe covering large swaths of skin, itching like mad. The hives were minimally controlled with high doses of antihistamines. She had several scary anaphylactic reactions and carried an epi-pen at all times. The illness was progressive and frightening. In addition to allergic manifestations she suffered with: chronic fatigue, migratory joint pain, numbness and tingling and brain fog. She tested positive for alpha gal antibodies. Alpha gal is short of galactose-alpha-1,3 galactose. Alpha gal is a carbohydrate not found in our bodies but present in other mammals we ingest, i.e. cows and pigs. A protein in lone star tick saliva promotes the production of antibodies against the foreign carbohydrate leading to the disorder. Alpha gal allergy is not a benign disorder. Despite claims to the contrary, patients may become sensitive to many other foods, including dairy, eggs and poultry. In the case of this patient, she became reactive to foods high in histamine and histamine promoters (such as tomatoes, eggplants, strawberries etc.). She developed a generalized, systemic mast cell disorder. To the best of my knowledge, this has not been described in literature. When I first met her, several months ago, she had acquiesced to the notion that hives would always be with her. But we got her better. Treatment has included: therapy for mast cell activation disorder and long-term antibiotics. The former daily hives now occur once monthly at most. Mast cell programs have previously been described. A low histamine or mastocytosis diet is required. In addition, high doses of antihistamines: H1 and H2 blockers, Singulair (leukotriene blocker) and cromolyn (mast cell inhibitor) have effectively controlled her symptoms. Long-term antibiotics have been very helpful, controlling fatigue, numbness and tingling, joint pain and brain fog. We she came to see me she was only worried about alpha gal not realizing how much persistent Lyme was affected her. This disorder is associated only with bites from lone star ticks (perhaps chiggers) but not deer ticks. Yet another reason to avoid tick bites at all (reasonable) costs. Everything I said in the last post needs to be taken with a grain of salt. A 40 year old patient from Texas recently presented to my office with: fatigue, headache, crawling sensations, shooting ear pain, feeling hot, hearing loss, lack of endurance, poor sleep, sound sensitivity, brain fog, swelling of lymph nodes, irritability and other strange sounding symptoms. She denies ever experiencing: night sweats, air hunger, fevers, depression, mood changes or tearfulness. She had previously tested positive for Lyme antibodies. This patient's Giemsa stained blood smear shows a high level of parasitemia. 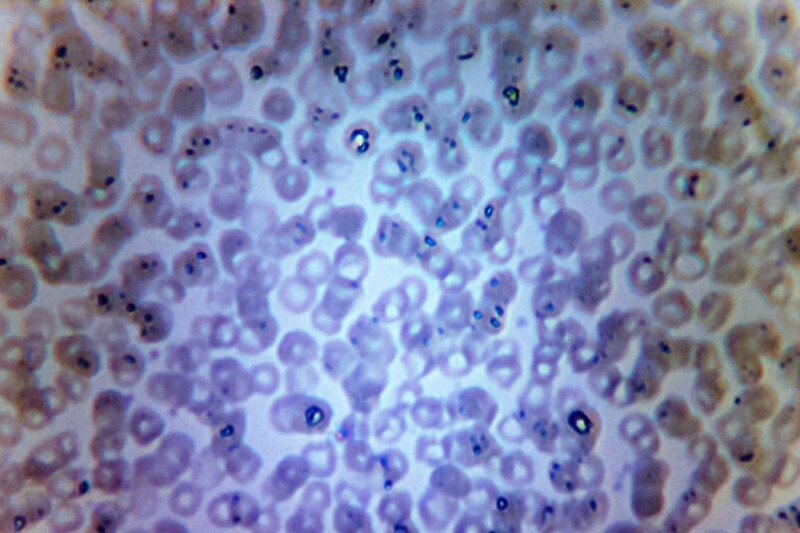 (High levels of Babesia in the blood). Babesia antibodies were not present. Only B. microti and B. duncani tests are available. LabCorp is offering the B. duncani or WA1 antibody test again. Direct examination of freshly prepared stained blood smear remains the gold standard for the identification of the organisms. Other, high tech modalities may be limited, especially when the particular species is unknown. These other tests may include: PCR and FISH. Some patterns of disease are frequently observed, but the disease as a whole, remains quite unpredictable. A coinfection cannot be excluded based on history alone. On the flip side, a negative blood test does not exclude the presence of coinfection. In this case Babesia. All available Babesia tests are imperfect. One of the many challenges. From STAT we learn that Willie Burgdorfer, the Swiss microbiologist who discovered the Lyme bacterium also discovered a long discarded something else. The mysterious sounding Swiss Agent. Sleuthing the mysteries and controversies surrounding Lyme, modern day researchers have uncovered 40-year-old papers which denote the discovery of the Swiss Agent bacterium. In a note to himself, Burgdorfer asked himself: “I wondered why somebody didn’t do something.” “Then I realized that I am somebody.” The agent is known by science to be Rickettsia Helvetica. The organism is purported to cause a Lyme-like illness. The primary investigator at the CDC told the author that molecular biology methods will uncover the germ but the process will take several years. * (Their priorities are clear). Infection with the agent and associated illness is better known in Europe. It is said to cause debilitating symptoms including: fatigue, headaches, muscle weakness, meningitis, facial paralysis and (sarcoidosis?). I am not vouching for the veracity of this statement. The paper lays bare, in the starkest terms, the gist of the issues central to the Lyme wars, naming names. Rickettsia are a genus of tiny, gram negative, obligate intracellular bacteria. Intracellular bacteria are notoriously difficult to eradicate. The best known disease caused by Rickettsia is the redundant sounding Rickettsia rickettsii which causes Rocky Mountain Spotted Fever. RMSF is one of the most severe and potentially devastating tickborne illnesses and thankfully is rare. Many of my patients test borderline positive for RMSF and I have long considered this evidence an unknown cross-reacting species of Rickettsia. These germs are primarily treated with doxycycline. This is another reason why doxycycline should always be incorporated into the treatment of patients with tickborne illness, at least early on, unless there is a compelling reason not to do so. I suspect this exotic sounding germ: The Swiss Agent – is a relatively minor and fairly benign coinfection. We do not need another explanation for the chronicity of Lyme. The evidence, both clinically and in the laboratory is clear. The article states the IDSA position is that Lyme is characterized by a bull’s eye rash and “pinpoint” lab test and cured with 2-4 weeks of antibiotics. Really? The Lyme syndrome is consistently a product of Lyme (borreliosis), babesiosis and bartonellosis. The exact species of which is more often than not, an unknown. A simple categorization based on stereotypic symptoms is more common than I would have once thought. Babesiosis: recurring flulike symptoms, night sweats (or day sweats), air hunger, low grade fevers – usually in the late afternoon and depression with inexplicable sudden tearfulness (even in macho men). Bartonellosis: Pain in non-joint regions (tendons, muscles, plantar fascia or bottom of feet, “shin splints,” neck pain, headaches and occasion characteristic rash. Other symptoms such as those of interstitial cystitis are also relatively common. Rather than depression, these patients complain of anxiety, irritability, anger, (Lyme rage) and other psychiatric symptoms. Lyme: Everything else. Fatigue (all 3), Exhaustion, poor sleep, migratory joint pain, cognitive dysfunction with brain fog, trouble finding words, trouble thinking clearly, episodic confusion, getting lost etc., weakness, numbness and tingling and usually others symptoms suggesting broader multisystem connections, for example: floaters, ringing in the ears, racing heart, change in bowel/bladder function and others. Patients will have visited many doctors and been told: they don’t have Lyme, they have fibromyalgia or chronic fatigue, they need to see a psychiatrist.